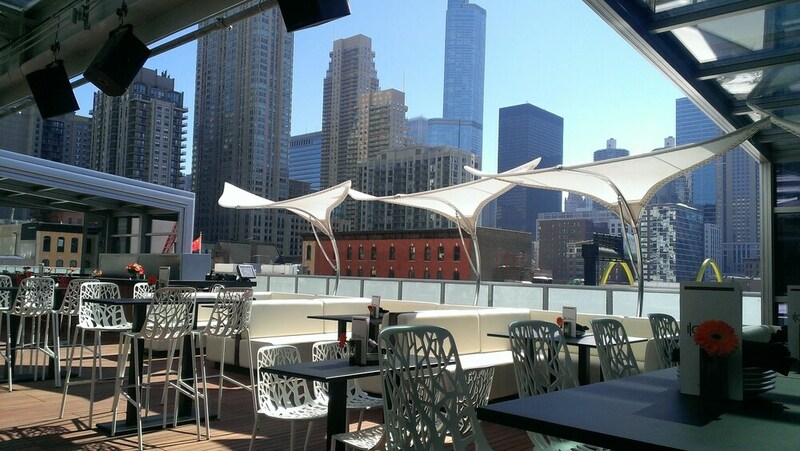 Located in River North, The Godfrey Hotel Chicago is within a 5-minute walk of State Street and within 15 minutes of other popular attractions like Water Tower Place. This 221-room, 4.5-star hotel has conveniences like a full-service spa, a 24-hour fitness center, and free in-room WiFi. This hotel is home to 2 onsite restaurants, perfect for a quick bite to eat. Order from room service to satisfy your hunger without leaving your room. Start each morning with full breakfast, available for a fee from 7 AM to 1:00 PM. Guests can expect to find free WiFi and 46-inch an LED TV with cable channels and pay movies. Beds sport premium bedding and the bathroom offers a hair dryer and designer toiletries. Other standard amenities include an iPod dock, a refrigerator, and a coffee maker. Guests of The Godfrey Hotel Chicago enjoy a full-service spa, a nightclub, and a 24-hour fitness center. Valet parking is available for USD 60.00 per night. Multilingual staff at the 24-hour front desk can assist with tours or tickets, luggage storage, and dry cleaning/laundry. Other amenities at this luxury hotel include a rooftop terrace, free WiFi in public areas, and a conference center. The Godfrey Hotel Chicago features a full-service spa and a 24-hour fitness center. Dining is available at one of the hotel's 2 restaurants. Guests can unwind with a drink at one of the hotel's 2 bars/lounges. Public areas are equipped with complimentary wireless Internet access. Event facilities measuring 10000 square feet (900 square meters) include a conference center. This luxury hotel also offers a nightclub, a rooftop terrace, and tour/ticket assistance. Parking is available onsite for a surcharge. The Godfrey Hotel Chicago is a smoke-free property. The Godfrey Hotel Chicago offers 221 air-conditioned accommodations with iPod docking stations and safes. Beds feature premium bedding. 46-inch LED televisions come with premium cable channels and pay movies. Refrigerators and coffee/tea makers are provided. Bathrooms include showers, bathrobes, designer toiletries, and complimentary toiletries. This Chicago hotel provides complimentary wireless Internet access. Business-friendly amenities include desks and complimentary weekday newspapers. Additionally, rooms include hair dryers and irons/ironing boards. Housekeeping is offered daily and in-room massages can be requested. Full breakfasts are available for a surcharge and are served each morning between 7 AM and 1:00 PM. Start your morning with a full breakfast, available each day from 7 AM to 1:00 PM for a surcharge. You can order up room service during limited hours.